Alexandria Smith’s exhibition, Monuments to an Effigy, takes the history of the A.M.E. Church and The Olde Towne of Flushing Burial Ground as a departure point for a new collage, sculpture, and sound installation. Smith will continue her ongoing exploration of narrative, memory, and myth through the lens of the Black female form and psyche. At Queens Museum, Smith’s practice of abstracting and deconstructing images of the body responds to the untold narrative of the Bunn family, whose male family names appear on the only remaining gravestones at the Flushing Burial Ground, but whose female voices have been historically silenced. Alexandria Smith is a recipient of the 2018-2019 Queens Museum/Jerome Foundation Fellowship for Emerging Artists. Smith and fellow recipient, American Artist, were selected by a five-person selection panel consisting of Lumi Tan, Curator at The Kitchen, New York; Anthony Elms, Daniel and Brett Sundheim Chief Curator at The Institute of Contemporary Art at the University of Pennsylvania, Philadelphia; Queens Museum’s Director of Exhibitions, Hitomi Iwasaki; QM Assistant Curator, Sophia Marisa Lucas; and QM Assistant Curator for Public Programs, Lindsey Berfond. Alexandria Smith (b. 1981, Bronx, NY) earned her BFA in Illustration from Syracuse University, an MA in Art Education from New York University, and an MFA in Painting and Drawing from Parsons The New School for Design. Smith is the recipient of numerous awards and residencies including: MacDowell, Bemis and Yaddo; LMCC Process Space Residency, a Pollock-Krasner Grant, the Skowhegan School of Painting and Sculpture Fellowship, the Virginia A. Myers Fellowship at the University of Iowa and the Fine Arts Work Center Fellowship. Her recent exhibitions include: a solo exhibition at Boston University (Fall 2018), the first annual Wanda D. Ewing Commission and solo exhibit at The Union for Contemporary Art in Omaha, NE, a traveling group exhibition Black Pulp at Yale University, International Print Center NY (IPCNY), USF and Wesleyan University and a commission for the Schomburg Center for Research in Black Culture. 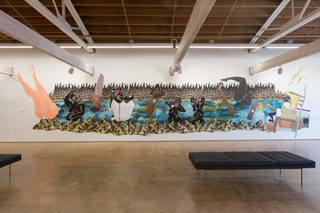 Her work is currently included in The Lure of the Dark: Contemporary Painters Conjure the Night at Mass MoCA.